Learn more about Tri-Churches here..
• Go to anglicanjournal.com/yes and fill out the form. • Email yes@national.anglican.ca with your name, address, phone number and ID number. • Fill out the notice in The Anglican or Anglican Journal and mail it to Anglican Journal, 80 Hayden St., Toronto, ON, M4Y 3G2. If you do not choose one of these options, your subscription to both papers will end with the June 2019 issue. The Anglican and Anglican Journal will continue to be posted online each month. Please reserve the date for lunch, you are invited! Sunday, May 5, 2019 at 12:30 pm. Our annual outdoor clean-up is Saturday, May 4, 2019 starting at 9 am. If you can come and give an hour of time it would be greatly appreciated. Tuesday, Wednesday and Friday at 11:00 am - for an hour. We have lunch together (please bring your own) and play games and cards. Tea, coffee and desserts are provided. The cost is 50 cents each week. On November 14, many hands were putting more than 100 ditty bags together. 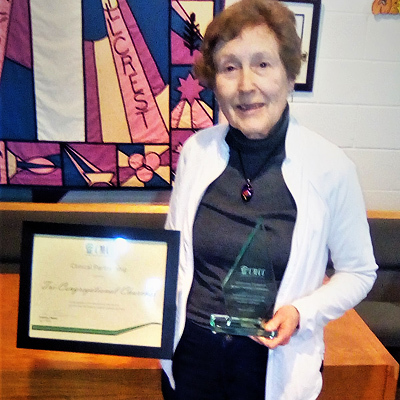 Margaret Black, Parish Nurse, attended an awards ceremony at the Canadian Memorial Chiropractic College which provides Clinic Interns (4th year students) to lead the SWIFT Seniors’ Exercise Classes, The SWIFT Program (3 classes/week) won an award for being a Community Partner with CMCC, providing experience to their students. Margaret also won an award for being the organizer of the program. Congratulations to all our leaders and class members for making this happen and thanks to CMCC for the recognition.